Avoid making the costly mistake of spending your valuable time and energy with a genealogy software not suitable for your needs. Here are the eleven essential features to consider before purchasing your genealogy software. GenoPro's solution to the 11 essential features is written in the dotted boxes. #1. Unicode Support. Unicode is about storing and displaying symbols from different alphabets. There is no substitute for Unicode. If a genealogy software does not mention Unicode, it is because it does not support Unicode. Most genealogy titles have been written without genuine support for foreign characters, meaning no Unicode support. By tracing your roots, you will find ancestors and relatives living in different countries having family names spelled with non-English characters. A quick test to see if a software may support Unicode is to type "André" and search for "Andre". Both names are the same, however most genealogy software will treat those names as different. Also, a non-Unicode software will place the letter "é" after the letter "z" rather than treating it like a variant of the letter "e". If your genealogy software cannot handle French accents, think about the problem you will face when entering a surname or a city name in Chinese, Hebrew or Russian. Accents are very important and you cannot ignore them without changing the pronunciation and/or the meaning of the word containing the accent. Unicode is about accuracy and future growth. GenoPro has full support for Unicode. GenoPro has supported Unicode from it's original development. GenoPro even has translations to languages such as Chinese, Japanese, Hebrew, Arabic, Greek and Russian. GenoPro has received thousands of genealogy trees containing names from different languages. If you are considering another genealogy title, make sure it does support Unicode. If Unicode is not mentioned as a feature, it is very likely it is not supported. Learn more about Unicode. #2. Graphical Pedigree Tree. Make sure your genealogy software can display a complete graphical representation of your genealogy tree. Can you see both ancestor and descendants at once? Make sure you are not limited to either direct descendants or direct ancestors charts. A graphical family tree is very important to display real life scenarios. Is your genealogy software able to display a second or a third spouse, to distinguish adoptive parents from biological parents, to distinguish between true siblings, half-siblings and step-siblings, and display twins and triplets? The graphical pedigree helps to find common mistakes such as a the birth of a child before its parents. This may sound obvious, but you will be amazed how many genealogy titles do not have adequate visual output. It is much more interesting to visualize a graphical tree than to walk through a list of names sorted alphabetically. Also, if you have a graphical tree, you can print it, copy & paste it to another application. 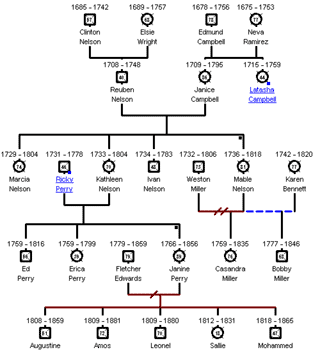 If your genealogy software does not provide a graphical pedigree tree, you are missing an important aspect of genealogy research. 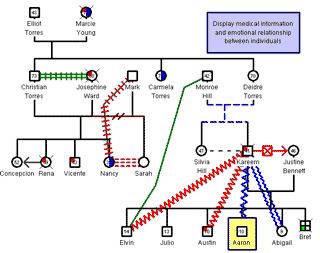 GenoPro's architecture was designed to create graphical pedigree trees and genograms. Using the mouse, you can position each individual where you want them to appear on the tree layout, or use the AutoArrange to have GenoPro pick a family tree layout for you. GenoPro's first feature was its graphical pedigree tree, with a stunning zoom ranging from 5% to 1000%. Most genealogy software will offer a zoom at 50%, 100% and 200%. With GenoPro, you can pick any value within 5% and 1000% allowing you to view dozens of generations at once. Increasing and decreasing the zoom is as easy as spinning the mouse wheel. You can also zoom in and out by using the toolbar buttons. #3. Integration. Can you copy & paste your genealogy tree to a PowerPoint presentation or a Word document? Can you copy your genealogy data to a spreadsheet? Can you export your genealogy data to Gedcom or XML for third party tools to analyze your genealogy data and/or generate a report on the web? 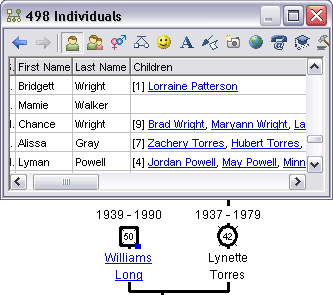 GEDCOM is an acronym for Genealogical Data Communication; it's a method of formatting the text of your family data so that different software programs and operating systems can read and understand it. Extensible Markup Language (XML) is the industry standard for large-scale electronic publishing and storing complex databases. XML is used by office products such as spreadsheets and word processors, books, manuals, emails, news services, search engines, catalog sheets, configuration files, product specifications, data-driven web sites, and more. You cannot afford to miss this opportunity by having a genealogy software not supporting XML. If you purchase a genealogy software that does not provide the support to import and export your data, your family data may be locked forever in a proprietary database format, meaning you will have to restart from scratch if you choose another genealogy software. GenoPro was designed to interact with other applications. First, GenoPro uses the XML as its core data format, so third party applications can open its files to analyze, edit or generate family trees. Using GenoPro's Table Layout, you can copy your data into a spreadsheet to perform some processing, or paste data from a spreadsheet into GenoPro. 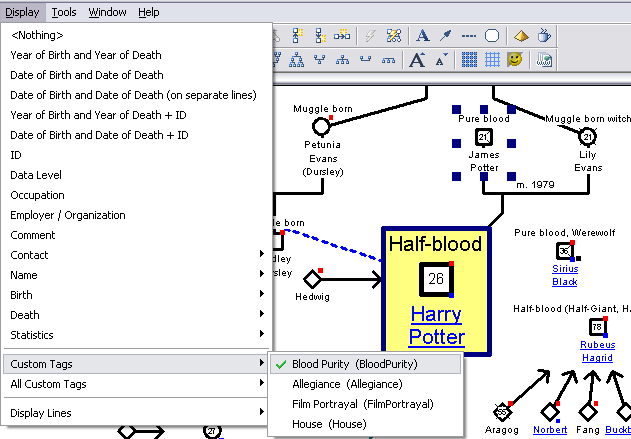 You can also copy and paste your genogram into any Microsoft office application or image processing program such as Photoshop. GenoPro can import and export Gedcom so you can exchange your genealogy data with other genealogy titles. #4. Generate Reports. Can you generate rich HTML reports? 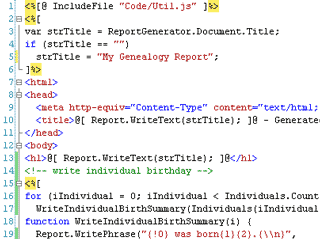 HTML reports with hyperlinks are wonderful for navigating through a genealogy database. Clicking on a hyperlink would bring the details of that individual, family or picture. GenoPro is equipped with an impressive report generator, a feature you will not find elsewhere. Under the hood, GenoPro uses state of the art technology used by Microsoft to power their web servers. The end result is not surprising: with a few mouse clicks, you can generate a rich multi-page HTML report with a picture slide show along with an interactive graphical tree in SVG. You have to generate such a report yourself to see how powerful GenoPro's report generator really is. You are also welcome to see sample reports generated by GenoPro users on our server: http://FamilyTrees.GenoPro.com. When it comes to customizing a report, there is nothing comparable to GenoPro's report generator. Every installation of GenoPro includes the full source code for each built-in report. With one mouse click, you can start customizing any report you wish. The sky is the limit! What you can imagine in your report, GenoPro can generate it for you. GenoPro can load custom COM modules made in other programming languages such C++, C#, VB.NET or Java and/or connect to external databases such as Microsoft SQL, MySQL, or Oracle to fetch the data you need for your report. GenoPro's report generator is so flexible that the report skin named English Narrative Report was created by one of our customer wishing to customize his report. After having customized his report, Ron Prior submitted his narrative report into our support forum so others can benefit from his work. Ron did such a nice job that we scrapped our own report to include a copy of the English Narrative Report as a showcase for the report generator. Later, Ron customized the report even more by adding interactive scalable-vector graphic (SVG). Since then, the English Narrative Report has been translated into several languages. 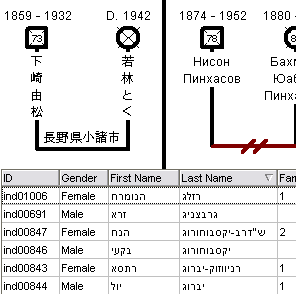 If you visit http://familytrees.genopro.com/, you will find some of those reports completely written into non-English languages. With the permission of the authors, we have included these report templates into GenoPro. #6. Custom Data Fields. Can the genealogy software you are considering store additional data specific for your needs? For instance, you may want to trace the genealogy of a family having a genetic medical disease. In this case, you would use the user-defined fields to store information about the disease, diagnosis and lab results. In another case, you may want to record the performances of each athlete in a hockey team recording the statistics for each season. In a family having a strong military service, you may want to enter the military grade and other relevant military details. There will always be an additional piece of information you will need to enter regardless how many pre-defined data fields are available. 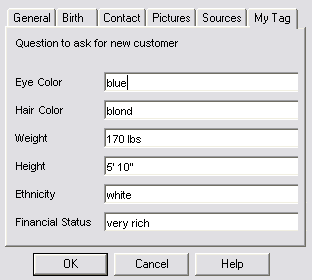 Custom data fields allow flexibility. Having custom data fields is not enough. You want to make sure those custom fields are accessible. Next you need to look on the level of customization. This is why the custom data fields are so important. Most genealogy titles have room for a few user-defined tags; GenoPro lets you have as many as you wish. Using the Tag Editor, you can create an unlimited number of custom fields. When the number of custom fields cannot fit in one tab (dialog), you may split them to another tab; otherwise, GenoPro will display a scroll bar in the dialog. Each object has room for its own user-defined tags: individuals, families, pictures, places, and sources. For instance, you may have a custom field for your pictures such as the name of the photographer, the camera and the objective lens. Similarly, you may wish to have custom tags for a place to record the owner, lot number, evaluation, and some other information relevant to you. All custom tags are editable from the Table Layout. Custom tags are typically located in the right-most column; however, they can be anywhere if you customize the order of columns in the Table Layout. User-defined data fields are also accessible through the report generator. If you generate a report using the skin named English Narrative Report, you will see the custom fields in the HTML pages. 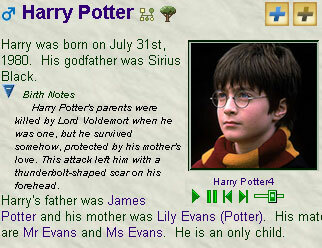 If you visit Harry Potter's report (http://familytrees.genopro.com/harry-potter/) and click on the , you will see the following custom fields: Blood Purity, Allegiance, Film Portrayal and House. #7. Compile Statistics. Statistics are very important to find potential mistakes in your genealogy tree. For instance, by looking at the oldest individuals, you may find a mistake in the date of birth or date of death. Statistics are good for curiosity, such as who has been married the most often, who got the most children, how many individuals have been adopted, what was the youngest/oldest parent, etc. The more statistics available, the more interesting genealogy will be. GenoPro's Table Layout is the most powerful tool to find errors and/or display statistics about your ancestry. The Table Layout is able to sort any column: names, age, number of pictures, number of children or number of mates (spouses). The Table Layout is extremely flexible; you can hide any data from the grid to refine your search. For example, you would like to find all females over 70 with more than 5 children. Using GenoPro's Table Layout, you click on the gender column. This will sort all the individuals by gender, thus grouping a males and females together. Holding down the Shift key, you can select all the males and hide them from the Table Layout using the following toolbar button . Repeat again by clicking on the column named Age to sort by age, and remove all individuals (females) less than 70. Next, click on the column Children Count to sort by number of children. Remove all individuals (females) having less or equal than 5 children. As a result, the Table Layout will display only the females over 70 with more than 5 children. You can copy & paste the entire content of the Table Layout into a spreadsheet program to "save" your search result. 1. Age. This column displays the age of the individual. Any negative age is obviously an error. The same assumption can be made for ages over 150. 2. Age of Mother at Birth. This column displays how old the mother was when the individual was born. Again, a negative age is an error, however the range is much less, typically ranging from 15 to 55. For instance, it would be an error to have an 8-year-old girl as a "mother", or a mother having a child at the ripe old age of 88. 3. Age at Child Birth. This column displays the age of a mother at child birth. Usually, there is a continuity in child births, as it is very rare that a mother has two children in the same year or two children with a 20-year gap in between. 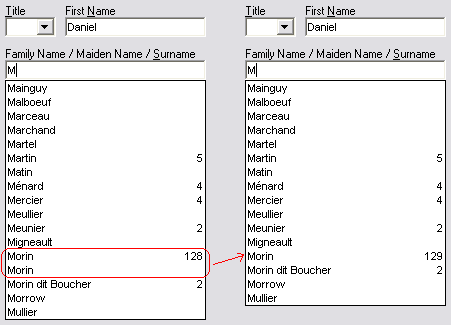 Using this Table Layout column, you can quickly spot potential errors in your family tree. #8. More Than Ancestry. Does the genealogy software you are considering include other elements emotional relationships like friendship, love, harmony, distrust, jealousy and hostility? Can you include complex social relationships? GenoPro does a lot more than ancestry. In fact, more than half of our customers are professionals, such as social workers, therapists, and health professionals. Using GenoPro, you can document an entire community, from blood lines to adoption, including social relationships and emotional relationships. 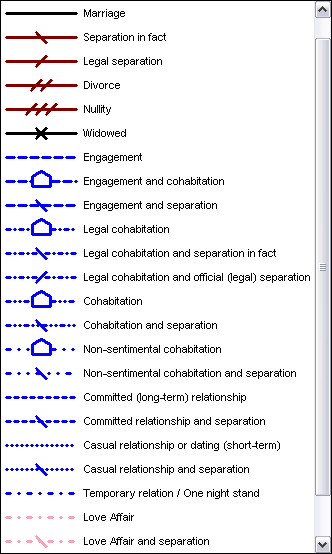 GenoPro also displays special symbols to distinguish different family relationships such as marriage, divorce, cohabitation and love affairs. GenoPro also has 33 built-in emotional relationships, with colors and line styles to help you see the global picture of the relationships between family members. Documenting the family emotional relationships is very important, as some love affairs or grave quarrels have changed the course of history. #9. Easy Navigation. Can you navigate easily through your genealogy data? 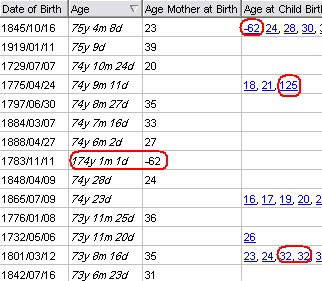 Let's say you are editing an individual and want to change the date of birth of one of his children. Is the child easily accessible, or do you have to go back to the master list and perform a query to find the child? Easy navigation is also a channel to get statistics and instant reports. If an individual has been married four times, can you quickly access each spouse with a single mouse click? Can you do the same with adoptive parents, twin sibling, pictures, etc? GenoPro offers a wealth of functionalities to navigate through your genealogy data. The most obvious feature is its graphical tree with its easy-to-use zoom, making navigation as intuitive as reading a map. To simplify the navigation furthermore, GenoPro has introduced a novel concept to split a large family tree into smaller sub-trees. With a few mouse clicks, you can move a branch of a family tree into a different GenoMap. The individuals common to both GenoMaps will be automatically hyperlinked, allowing navigation from one GenoMap to another with a simple mouse click. 1. Each time you select a row in the Table Layout, its corresponding individual or family is selected in the graphical display. This is extremely useful if you do not remember the position of an individual or family in the graphical display, but you know you can find it in the Table Layout by searching by the name or by some other method. The Table Layout also has a built-in Find dialog where you can search text in any column. 2. The Table Layout has hyperlinks to jump from one individual to another. The hyperlinks are also very useful to "drill down" and find more information about a picture, place or source/citation. The Table Layout maintains a full history of visited hyperlinks so you can go back to your original selection anytime you want. GenoPro also supports bookmarks to enhance navigation. A bookmark can follow a graphical object such as an individual or a family, or remember a particular position (x,y) on the graphical display. When you invoke a bookmark, GenoPro will scroll the display to center the target object or position x,y. Bookmarks are accessible from the Table Layout and you can have an unlimited number of them. You can bind up to 9 bookmarks to a hotkey. Each individual or family can be opened from a plain double-click to view additional information. When viewing the properties of an individual, click on the Family tab where can view a summary of all relatives (parents, siblings, mates and children). Similarly, you can click on the Family's Summary tab to view a summary of a family which includes the parents, children and other spouses and children interacting with this family. #10. Auto-Completion Auto-completion is a feature used to enter information into form input fields. Due to the nature of the genealogical data to be entered into the program, for example, repeated family names and places, it is beneficial to have a feature that can save you redundant typing and help reduce potential errors. Every data field in GenoPro supports auto-completion. GenoPro's auto-completion is one step ahead the typical auto-complete by displaying the frequency of each unique instances of text. In the example above, there are 5 individuals with the last name "Martin" and one individual having the name "Matin". The surname "Matin" could be a typo, especially if the siblings are named "Martin". Also, there are 128 instances of the surname "Morin" and one instance of "Morin ". Notice the space after "Morin" is not visible on the display, however the auto-completion handles "Morin" and "Morin " as distinct text. By removing the tailing space we have now 129 "Morin". In genealogy, names do repeat often. The auto-completion will save you hours of tedious work and give you peace of mind for data integrity. #11. Low System Impact. If you need a reboot after installing a genealogy software, you are in serious trouble. This is not a joke or a clever sales pitch. It is like suggesting to replace your engine to fix a flat tire. Some software does overwrite system files with their own outdated files, thus requiring a reboot for the changes to take effect. 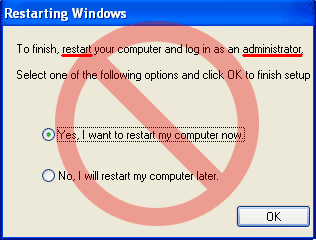 Any software that does overwrite system files may eventually stop working on a newer version of Windows, or worse, cause Windows to stop working after the reboot. 1) No uninstall available. A genealogy software unable to uninstall itself is a leech on your system. There is probably a good reason why the software is unable to uninstall itself: it has overwritten some system files and cannot undo what was done. 2) Pay close attention for a "backup" option when installing. Why do you need to perform a backup when installing a new software? Well, such poorly written software will "backup" the system files before overwriting them, thus putting the burden on you if anything goes wrong. Unfortunately, the next time you install the same software, the backup will overwrite its first backup, leaving you without the original system files. You are out of luck, and it is "your fault" since you answered "yes" to perform a backup twice. Stay away from this kind of junkware. 3) Look at the size of the download package. If you have to download an install program of 15 MB for a modest genealogy program, be careful. It is likely the download package does contains 14 MB of system files and 1 MB of genealogy software. If you are suspicious, go visit the home page of the software maker and read the FAQ about the installation. Usually, it is all written there, although the designers don't brag about it. 4) Read the bug history. Poorly written software have an extensive bug history with bugs specific to a particular version of Windows. A well written genealogy software should run flawlessly on all version of Windows. If you wish to predict the future, look at the past. A buggy software is likely to have bugs in the future, and a software who had compatibility issues when upgrading Windows is likely to stop working next time you upgrade Windows and/or buy a new machine. GenoPro does not modify nor install any system files. All files required to run GenoPro are copied in the folder where you install GenoPro during setup. You can install GenoPro in any folder you wish, and you can uninstall GenoPro without leaving any leftover files. GenoPro's installer is entirely optional, as you can simply double-click on the file GenoPro.exe and have it fully running. The benefits of using the installer is the creation of shortcuts in the Start menu as well as having a few sample family trees. Uninstalling GenoPro is done from the Windows Control Panel or by deleting the folder containing GenoPro. Installing GenoPro produces a very small footprint on your computer. The whole download package of GenoPro is less than 7 MB GenoPro can run perfectly on older hardware, Windows XP to Windows 10 are fully supported. GenoPro continues to be maintained, updated and tested on newer operating systems and computers. 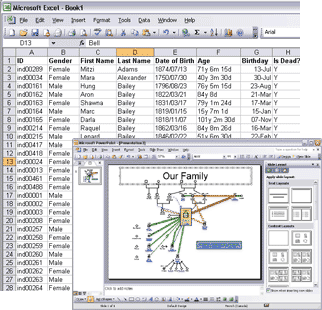 GenoPro was developed using the same programming language and tools used for the development of Microsoft Office and Windows itself. The code written uses clean programming techniques to ensure the software will run on future releases of Windows. It is worthy to mention that the original GenoPro version 1.00, released in June 1998, runs on all platforms from Windows 95 to Windows Vista. Purchasing GenoPro is a wise investment, as GenoPro will run on standard hardware for the next decades. You won't have the dilemma of having to keep your old computer to use some genealogy software unable to run on modern hardware. * With 4 MB of RAM on your machine, you will be limited to a family tree of about one thousand individuals. You will need more memory if your document is larger or if you have a large number of pictures in your family tree.